When chronic pain, Fibromyalgia, Diabetes, Crohn's, or other long standing conditions affect your activities, you may find it hard to exercise. Workout routines may be thwarted by variable pain and fear of making things worse. Showing up at the gym may be daunting when you see the fit folks bouncing along. Yet if your doctor has suggested you get into better shape and has permitted you to move under your own judgment, this type of counseling may be a good way to begin your trek toward getting fit again. 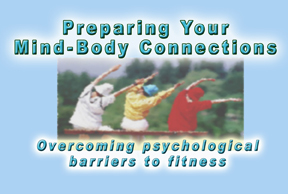 With Mind-Body Connections, you will learn ways to communicate and explore the latitude you already have in your movement to use it to gain better fitness. Learning breathing techniques that help handle stress and that allow productive stretching, you can start to build up strength even before you touch a weight. These core skills can help you handle stress and build strength, helping you fend off depression and improve your metabolism. Dr Warner will work with you individually to help you prepare your approach to well-being and fitness, assessing your handling of pain, working with your other providers to develop a pain and action path to reach your health and fitness goals and to improve your emotional resilience as well. Your attitudes, experiences and fears about movement and exercise will also be covered in individual sessions as your plans for movement and fitness are developed and are explored. This is a slow and gentle process of approaching and mastering some level of fitness appropriate to your ability, as laid out by your providers and by your own desires and judgment.